Home/Central banks, English, Financial crisis, Financial markets, Global economy, Growth forecasts, preparation, Stock market/Q-review 2/2018: Duck and Cover! The world economy is hurtling towards a global crisis. The stock market turbulence, the economic rout hitting the emerging economies and the re-emerged political and banking problems in the Eurozone are first signs of the impending global depression. More is on the way. 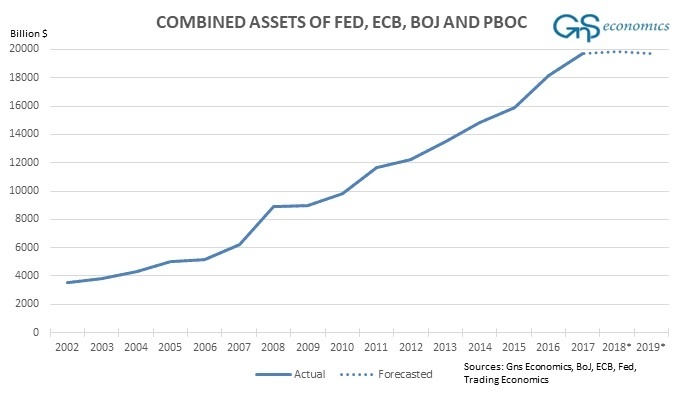 Business cycle turning points are critically important now because the decrease in central bank liquidity (see below) leaves the “global growth narrative” as the only mainstay for asset markets. If this support vanishes, asset markets may follow the same chaotic path as in 1929. In 1929, the stock market of the US crashed from high valuation levels because the faith of investors in the ‘Roaring Twenties’ was broken. The Dow Industrial Average lost almost 29 % of its value in a week and the crash started a bear market; this ceased only in July 1932. From its peak, the DJIA fell by almost 90%. Figure. The value of actual and forecasted value of the balance sheets of the BoJ, ECB, Fed and the PBoC. In the full report, we present how the businesses, households and investors can shelter themselves from the upcoming global crash. The time to prepare for the coming ’economic storm’ is now! Buy the full report (€112 + VAT)! Purchase the annual subscription, 4 issues with €325 + VAT, delivered directly to your email. By Tuomas Malinen| 2019-02-18T16:30:32+03:00	kesäkuu 18th, 2018|Central banks, English, Financial crisis, Financial markets, Global economy, Growth forecasts, preparation, Stock market|Kommentit pois päältä artikkelissa Q-review 2/2018: Duck and Cover!